At Joy Lutheran, our little church in Tulsa, Okla., I enjoyed assisting at communion and reading the lessons at Sunday services. At other times, I ushered and counted about 60 members attending. That was a good number. When we moved to Salisbury and St. John’s, in 2012, I was lost in the size of this building, cathedral-sized by Oklahoma standards, the size of the congregation, the immensity of the choirs, bell choir and pipe organ, the number of its programs, and the size of its budget. I finally got up the nerve to put my name on the volunteer lists to read the lessons and assist at communion. Today, seven years later, I read the lessons and usher occasionally. I recall the first time I read. We normally sit on the right side about halfway up, but when either Jill or I read, we move to the left side at the front so that it is not a long walk to the lectern. I was scared that first time — reading to 300 people I did not know well, instead of 60 friends. It was a relatively easy lesson to read with no tough biblical names, so that was not a problem. But 300 people? With a magnificent choir behind me and 300 people in front of me? I had learned in Toastmasters many years ago to single out one person, make eye contact, and read to him or her. I had also been told to imagine that the 300 people were naked. But I could not do that in church. That would make it easy to read. But I was still scared. On Friday and Saturday before my turn, I rehearsed the reading several times, finally reading it to the birds and squirrels from our deck early on Sunday morning. I was ready. We got to our new seats, now among complete strangers, and somewhat afraid that someone would ask us to move from their seats. At the start of the service, there was a prelude, a music piece to be played on the cello. That would be soothing and relaxing. When that time came, this 11-year-old boy, sitting with his parents in front of me, walked to the altar, picked up this cello, bigger that himself, and played the most beautiful music ever heard. He did it with such poise. When finished, he carefully laid the cello down and returned to his seat. “If this 11-year-old can do it, I ought to be able,” I said to myself. Trembling, I approached the lectern at the given time. On the floor was a wooden box for the shorter folks to stand on. I certainly did not need it, so had to clear it out of the way, making some unruly noise as I kicked it aside. That was my start. As I started to read, I picked out the gent I wanted to read to, made eye contact, and continued, thinking of that little boy and the big cello. I read the lesson fine, with no mistakes. If this little boy could do it, I could. 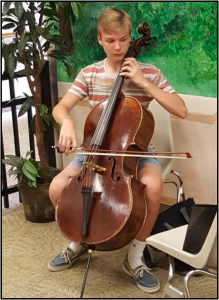 To this day, seven years later, Kevin Agner, now a senior in high school, still plays the cello exceptionally well. He has even been a soloist with the Salisbury Symphony. Once in a while, I still get to read the lessons, and occasionally, Kevin plays the cello at the same service. On those times, I walk to the front of the church thinking, “If Kevin can, I can.” At other times, I think of Kevin as I approach the lectern. There’s got to be a lesson here. There are gregarious and outgoing people in this world who are not afraid to try anything. Then there’s me and other people like me. I suppose there have been lots of “Kevins” in my life that have helped me out of my comfort zone, but I will never forget this one. Maybe one day I can be a Kevin to someone else. I hope so. Jack Connery is a resident of Trinity Oaks and a member of its Memoir Writing Class. This is one of the assignments he wrote for that class.